Each adhesive product manufactured by Coastal Enterprises is made especially for use with Precision Board High Density Urethane and with specific performance characteristics in mind, enabling you to tackle any bonding challenge. We pride ourselves in making our HDU adhesive with the highest of standards in mind. Our satisfaction comes from providing our customers with strong and durable bonds, every time. We set out to create the best adhesive to bond our Precision Board HDU, and after exhaustive work in the lab, our chemists have formulated three products to meet the needs of the artistic and industrial customer alike. PB Fast Set is an amber-colored, one part urethane adhesive that fully cures in 30 minutes. It works well for indoor or outdoor applications. 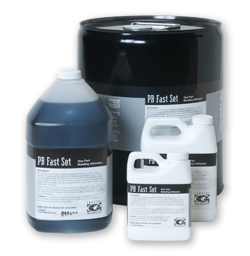 PB Fast Set HDU Adhesive cures from liquid to solid with a slight amount of moisture. Use it to join Precision Board High Density Urethane sheets to make them longer or wider, and to laminate sheets together to make them thicker. The consistency of PB Fast Set HDU Adhesive is similar to honey, making it easy to apply directly from the container. Throw out that dipstick, no mixing is required! It works wonderfully on wood, metal and most other materials. PB Fast Set HDU Adhesive is easy to cut, carve, sand and machine, and cuts cleanly. Cure time: Full strength cure 30 minutes. For slower cure and more working time, use PB Bond-240 HDU Adhesive. Lightly spray or wipe mating pieces with water just prior to application. Apply just enough PB Fast Set to change the color of Precision Board HDU. Allow minimum of 30 minutes prior to moving bonded part. Keep adhesive back from outer edge for ease of sandblasting. Clamping is necessary. To blend joint into background after sanding, prime with FSC-88 WB primer/filler. Drill small hole in cap to act as dispensing nozzle. After using, cover hole with tape.